Microsoft's Windows 8 doesn't hit the shelves until October 26, but here's how the packaging will look. It'll come in a white box with the Windows 8 logo providing a window to some pretty psychedelic colours. 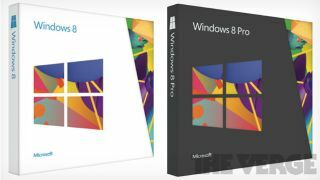 The Windows 8 Pro box will have the same design, but in black. The final version of Windows 8 leaked online recently. Microsoft had to stop referring to its design language as 'Metro' recently, due to a potential trademark dispute with German retail giant Metro AG. Microsoft will retain the tile-based UI, but now has to refer to it as simply the 'Windows 8 style UI'. Metro AG threatened legal action over the name. Some customisation options for the Windows 8 Start Screen also leaked recently. And they look pretty nuts, ranging from floral designs to pixel art. You can even pick and choose your own colour scheme, which is a nice touch. Windows 8 is thought to be the biggest overhaul for a Microsoft operating system in 10 years. A version will be optimised for touchscreens as well. Microsoft's Surface tablet PC will launch the same day as Windows 8. Its hardware partners aren't overly thrilled with the prospect of competing with Microsoft directly. Especially seeing as Microsoft started work on Surface after seeing its partners' designs. Windows Phone 8 will launch around the same time, with a similar tile-based UI. So the end of the year should be a busy time for Microsoft.